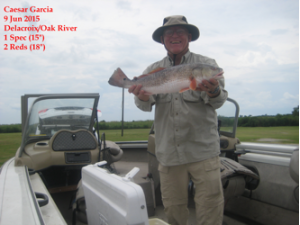 Today was my first venture out from the new fishing camp at Delacroix. We brought it out from Baton Rouge last Sunday and got it all set up. I didn’t expect too much in the way of fish today because this is more of a winter spot. It should get pretty good this fall. I did explore some new areas down at the end of Oak River. From there we’ll be able to go out to Black Bay and spots like Stone Island. I’m planning to spend Sunday night thru Wednesday at the new camp.